Book recommendation: “The Giant Killer” by A.L.O.E. I recently finished reading an intriguing story by ALOE (A Lady Of England) to my children entitled, The Giant Killer (1856). This allegorical tale (told in a fashion similar to Bunyan’s Pilgrim’s Progress) is about a noble knight named Fides who battles giant sins such as Giant Untruth, Giant Hate, and Giant Pride. Reading this to my children gave us much to talk about and helped them understand the battles with sin that we all face. The battle continues to rage, day by day and moment by moment. But must we meet the enemy blindfolded? In order to subdue, we must see the real foe; in order to conquer, we must face the true enemy. Through this allegorical tale, we will be better equipped to recognize, then to effectively slay, the many Giants who confront us. We will break through the web of Sloth, struggle out of the pit of Selfishness, choke up the fount of Anger, flee the secret lurking-place of Untruth, and triumph over our most malicious enemy—Pride. The Giant Killer is the tool to reach for if you or your loved ones need encouragement or confidence to enter into the battlefield once again. If you feel that you have nothing firm upon which to lay hold, this book will help you to grasp the strong cord of Love as your means of safety and deliverance. 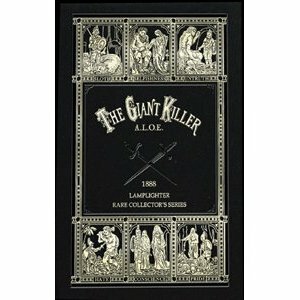 Another wonderful book from Lamplighter Publishing, The Giant Killer is an allegorical story of Christian warfare. Constantine and Adolphus, twin brothers, are sent to live with the Roby family to have Mr. Roby educate them. The spoiled 10-year-olds have much to learn about kindness, thankfulness, and manners. Mrs. Roby teaches these children and her own about godly character traits through stories about “The Giant Killer.” The Giant Killer must fight and conquer the Giants of Sloth, Selfishness, Untruth, Hate and Pride with the sword and armor given to him by his King. Your children will learn as these fictional children did to fight the enemies of the King that are in their own hearts. Although this is not the best Lamplighter book I’ve ever read (The Basket of Flowers still holds the position of number one for me), it is still a good book that I recommend, and espeically for Christian parents to read to their children. This entry was posted in Recommended Books, Reviews and tagged Bible, Blogging, Books, Christianity, church, Faith, God, Jesus, Literature, Religion, Theology. Bookmark the permalink. We enjoy Lamplighter books also and I agree that so far, “The Basket of Flowers”, but “The Hedge of Thorns would be a close second. We are currently reading “Helen and Her Temper.” One of my children quickly pointed out Helen’s unChristlike attitude(one which she sometimes displays herself-isn’t it so much easier to recognize sin in others than in ourselves?) I’m praying that God will open her eyes and bring the gift of repentance to her this year. I may have to bump “The Giant Killer ” up on our reading list! Lamplighters are phenomenal books. I’m surprised more Christian blogs don’t feature them as they have so many great stories with Christ the focus, through and through. The audios are exceptionally well-done, perfect for road-trips as well. have original book published in 1868, has name John Hooper Eddis (1869) and Edith Eddis written inside cover, anyone have any information on ancestry of these people? I can only find information on their names but no further.